Sometimes I design an experiment really wondering what will happen, but that wasn’t the case when I first decided to compare proactive interference effects for verbal and visual memoranda. Proactive interference occurs when some information you have previously memorized disrupts your ability to learn new information. For example, having studied Spanish in high school could impair learning Italian vocabulary now: as you try to retrieve the now-relevant Italian word, you risk retrieving the previously-learned Spanish word instead. Learning new information also conflicts with remembering older information (that’s retroactive interference). Proactive interference is particularly interesting for me though because it helps address what happens to briefly presented and retained information like the arbitrary word lists or color patterns we ask participants to try to remember in short-term memory tasks: you can only observe proactive interference if the earlier stimuli remain in mind. If new stimuli overwrite these arbitrary lists or patterns, as is expected in many short-term memory models, then proactive interference wouldn’t occur. Testing whether proactive interference occurs for both verbal and visual memoranda seemed like an important way to assess whether parallel short-term memory systems operate for both kind of material. I had recently conducted a series of studies including a verbal recognition memory task designed to be analogous to visual recognition memory tasks, and I realized that it would be great to use these materials to estimate the size of proactive interference for verbal and visual information. There were two possible outcomes, each of which would be interesting: 1) proactive interference would be observed for verbal, but not visual memoranda or 2) proactive interference would be observed for both kinds of materials. We designed a release-from-proactive-interference experiment. 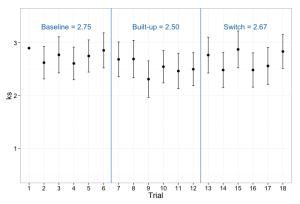 Participants observed a string of trials in which stimuli were drawn from the same set of similar materials. In the verbal task, this was a closed set of phonologically similar words (for instance, words that were close phonological neighbors to the word “cat”) and in the visual task, it was a closed set of similar colors (e.g., varying from blue to yellow). After drawing stimuli from this same set several times, we switched to a different set constructed in the same way. For verbal stimuli, this was phonological neighbors of “men” and for visual stimuli, it was colors varying between blue and red. If we hold lingering memories of the early trials that interfere with our ability to remember precisely which sequence of words that sound like cat we heard most recently, then performance should grow worse and worse as we keep drawing from the “cat” set. Then, when we switch to the “men” set, performance should spike because the fading memories of cat-like combinations cannot be confused for these novel men-like combinations. Lots of previous literature predicts that this pattern would be observed for verbal memoranda, and our study would establish whether something similar or different occurs with comparably constructed visual memoranda. Only we didn’t find much release from proactive interference with verbal memoranda. 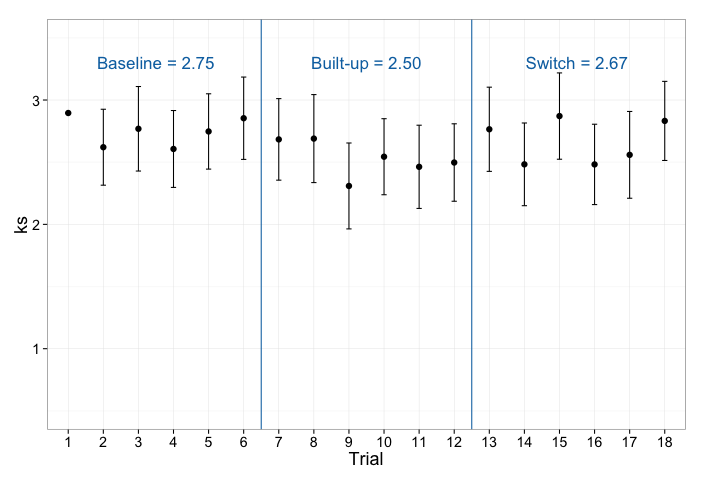 The graph below give estimates of verbal task capacity averaged across 18-trial blocks. The switch to a new stimulus set occurred on trial 13. 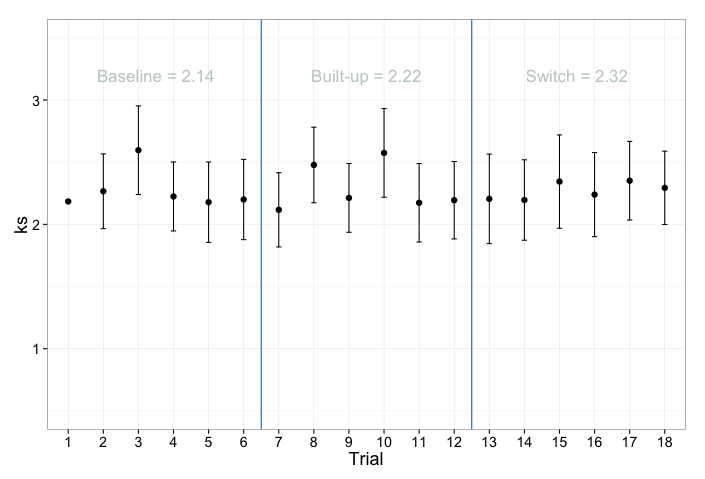 In our first experiment, we did observe performance in the right direction: on average, performance got worse from Trial 1 to Trial 12, and then got a little better again after trial 12. But not by much at all. These figures came from our first attempt. Though the evidence for proactive interference in the verbal task was underwhelming, at first we believed that we had a small but legitimate effect that was simply being masked by something trivial about our task or design, and with tweaking, we could make it emerge more strongly. At this point, I’ve conducted several follow-ups, and it never gets clearer. Sometimes we find no release of proactive interference with verbal stimuli, sometimes we find a very small effect. We don’t see it when participants have to reconstruct the stimuli rather than recognize them (at least, not yet). We don’t see it for verbal materials that are recalled via speech (at least, not yet). We never see it with visual memoranda, but that finding is difficult to interpret without the clear, expected verbal effect as a foil. A summary of the results of our series of studies on this, along with the data, analysis scripts, and experimental paradigms is available on OSF. This summary document outlines what we’ve done so far. I’m happy to #BringOutYerNulls and let anyone examine our progress with this; in fact, these results have been available on OSF for quite a while and I’ve discussed them with a few colleagues. 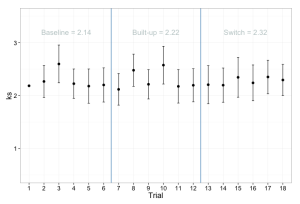 But interpreting a null effect, even in light of the strong expectation that an effect should have occurred, isn’t easy. There are many reasons why this might not have worked, and many of them are really boring. Possibly, these null results are really important: maybe there are boundary conditions on proactive interference that limit its generality, and if we firmly established these conditions we would know something novel and fundamental about memory.